PLEASE see OralCancerCause.ORG for information about Oral Cancer. Early detection is essential! Learn what YOU can do to detect this often symptomless disease EARLY. This site can also show you what You can do to HELP! According to OralCancerCause.org, "At your initial examination and every subsequent appointment the dentist should perform an oral cancer evaluation as a part of a complete and comprehensive examination. If you are a denture wearer it is important that you are examined for oral cancer at least annually. Each oral cancer examination should consist of a visual and tactile examination of all intraoral structures as well as the lips, perioral region and lymph nodes of the neck." Dr. Greg Mullins is a proud VCU graduate and an ardent VCU basketball fan. He and his father love attending VCU games together! Dr Mullins is completing a stint in the US Navy Aug 31, and working in our office part time until then, on his leave days. He has become a patient favorite in our office, with his calming demeanor, confidence, and very caring attitude. His top notch skills are a bonus. We happily look forward to Dr Greg practicing in our office FULL TIME starting Sept. 4 ! In recent years Dr Mullins spent a lot of evenings, after working all day at his Navy job, at the HELP Clinic on the Peninsula, when he wasn't out to sea. At the HELP clinic they treat military veterans and other citizens as well, who do not have the resources to receive care in private practice offices. Needless to say, Dr Greg met many challenging treatment situations there and rose to the occasion. He developed many surgery skills our patients in Smithfield have learned to respect and appreciate. We are truly grateful for his service, both in the Navy and in this clinic, as well. It tells us a lot about the character of the man, for sure! For example, Dr Mullins loves the concept of helping people retain loose or ill-fitting dentures by "snapping" them in with implants. We hope to see many Isle of Wight citizens benefit from his skills now and in the future! He has already begun helping patients in this way here in our office. 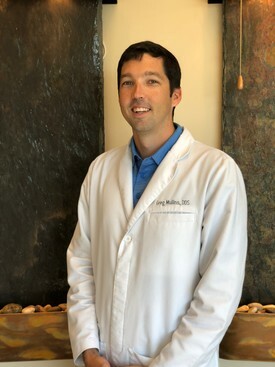 Interestingly, Dr Greg is following a career path learned at his mother's knee: Mrs Gail Mullins spent many years in one of the most well respected dental practices in Richmond, made famous by international dental guru Linda Miles, enjoying being part of the high quality patient care there until both she and her primary doctor retired. We welcome Dr Gregory Mullins to our practice wholeheartedly!! Dr Greg loves Smithfield and is planning to make it his home here, and to raise a family here; he truly believes Smithfield is a "Hallmark town." It is wonderful to see him enjoy our community and appreciate it the way he does! In 2012, Dr Gayle Terwilliger conceived and created this family and cosmetic dentistry practice in Smithfield, VA, devoted to the highest standards of client comfort, oral health, and stunning smiles! We love doing cosmetic dentistry, creating beautiful, stunning smiles! We provide a welcoming atmosphere for all those with dental fear, with an emphasis on educating the public. We have a serious focus on Prevention, devoted to gentle, compassionate, affordable, high quality care. Dr T created this practice to bring her strong belief in the effectiveness of preventative dentistry to Smithfield. Much dental disease is highly preventable, but too many people do not realize it. It is well known by dental professionals that we have the technology to REVERSE decay, STOP gum disease from advancing, and indeed it is possible to see oral health IMPROVE dramatically, instead of going downhill over time! Since opening the doors in Jan 2014, we have seen remarkable improvements in many, many Smithfield smiles! Dr Tom Witte is a "farm boy from Iowa," loving father, grandfather and husband, as well as a Board Certified Periodontist, which means he is a specialist in treatment of gum disease and everything related to bone and soft tissue supporting the teeth. His academic and professional credentials are truly awe-inspiring, but his greatest gift is the way he puts young and old alike at ease within 10 seconds of meeting him. People of all ages feel so comforted in his presence, it is a joy to watch. His clinical skills are extraordinary, just ask any of the patients he has helped locally, and we are so VERY lucky to have him here in Smithfield! Early in his career he taught at Georgetown University in the Perio department, and he also was a commanding officer in the Navy, with some very impressive command posts. He helped start a dental college in Japan, and after his Naval career he had a private practice in the Janaf area of Norfolk with 2 other periodontists for over 25 years. While there, Dr Witte began placing IMPLANTS to help patients regain the ability to CHEW after losing teeth. He was a pioneer in our region in the placing of dental implants, and to have his EXPERIENCE and EXPERTISE in all phases of periodontal treatment available to us here in Smithfield, is truly a wonderful gift. Dr Witte could be happily puttering (and putting) on a golf course, but he chooses to work here in Smithfield at least one day a week while also supervising senior VCU dental students at a clinic in Norfolk another day/week. He is a brilliant surgeon, kind and caring doctor, and sincere teacher. Dr Witte offered to come "help out" in the practice early in 2017 when Dr Terwilliger got her diagnosis of ovarian cancer, and had to spend much time out of the office getting treatment. Dr Witte very graciously has stayed on, and now offers our patients the opportunity to have an experienced surgeon place implants and do gum surgery, gently, effectively, right here in Smithfield. 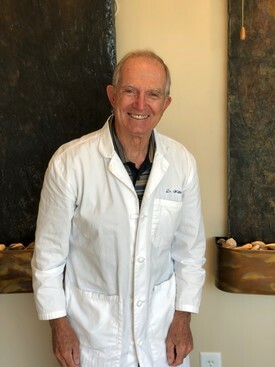 Dr Witte is "Board Certified" which is a distinctive honor in his field, and he has over 50 years of practice under his belt. We feel we are truly blessed to have him here in our office! !